Geneva, Switzerland September 9, 2014, report by the WMO. "In 2013, concentration of CO2 in the atmosphere was 142% of the pre-industrial era (1750), and of methane and nitrous oxide 253% and 121% respectively." Earth's atmosphere reached a modern record high in 2013 of 396 parts per million CO2, the biggest year-to-year change in three decades, according to the World Meteorological Organization in its annual report. 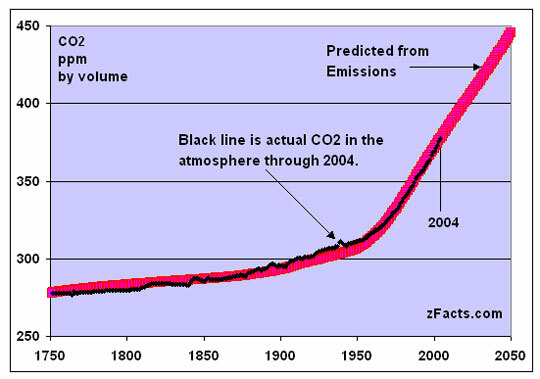 Graph by zfacts.comCarbonDioxide. September 25, 2014 Washington, D. C. - According to the September 2014 report by the World Meteorological Organization, the amount of greenhouse gases in the atmosphere reached a new record high over the year 2013. The WMO's Greenhouse Gas Bulletin shows that between 1990 and 2013 — only 23 years there was a “34% increase in radiative forcing – the warming effect on our climate – because of long-lived greenhouse gases such as carbon dioxide (CO2), methane and nitrous oxide. In 2013, the concentration of CO2 in the atmosphere was 42% higher than in the pre-industrial era starting in 1750. Methane climbed to 153% higher than the pre-industrial era; and nitrous oxide reached 21% higher. The global concentrations of CO2 rose to 396 parts per million in 2013 — an increase of 2.9 ppm from 2012. That is the biggest year-to-year change in three decades. Based on this current rate of increase, CO2 levels are expected to rise above 400 ppm by 2016.